- a bulb pump with a control valve. 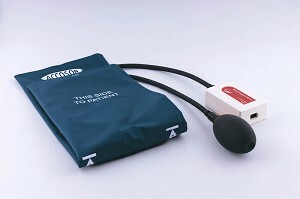 The blood pressure cuff consists of an inflatable bladder connected by one hose to a hand pump bulb and by a second hose to the pressure sensor box. The user can set the rate of cuff deflation manually with the control valve. • Study the effect of caffeine on blood pressure. The Blood Pressure sensor can be directly connected to the analog BT inputs of the CMA interfaces.